Thursday November 6th 1924 It was as warm as summer. Laura home all day. I was working on bead bag. Letters from both Hattie and Fannie. Edith in Pekin. Friday November 7th 1924 I was home all day. Wrote to Fannie. Laura up town to do errands. Martie down stairs. Weather cooler. Edith through Institute. Saturday November 8th 1924 I helped with the work. Martie did a big washing. Knit on bag. Martie down stairs. Sunday November 9th 1924 Went to church with Laura in taxi. Had letter from Warner McCall. Wrote Ruby Falk and Mary Moon. The Woolfs took all of us for an Auto ride in the afternoon. 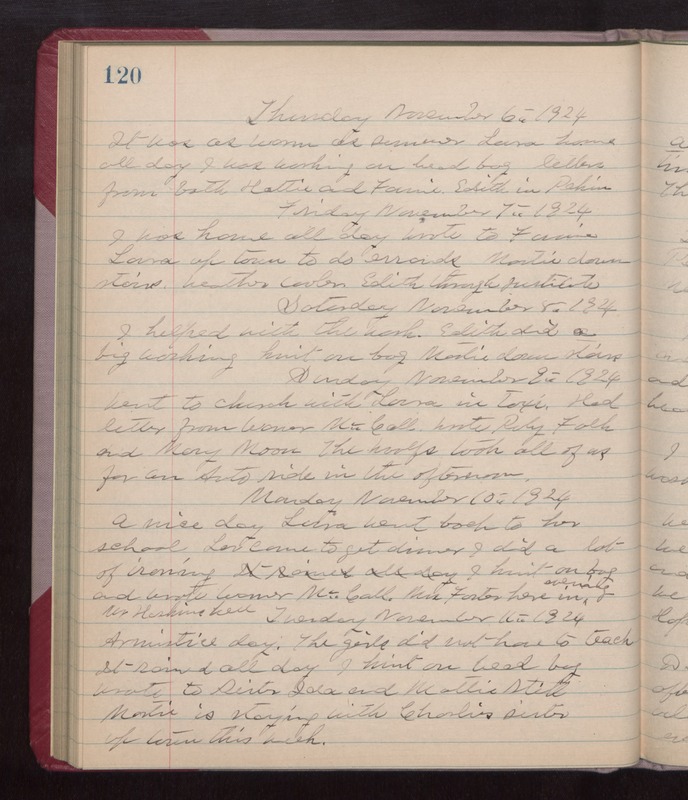 Monday November 10th 1924 A nice day. Laura went back to her school. Lou came to get dinner. I did a lot or ironing. I knit on bag and wrote Warner McCall. Mrs Foster here in evening. Mr Haskins here. Tuesday November 11th 1924 Armistice Day. The girls did not have to teach. It rained all day. I knit on bead bag. Wrote to Sister Ida and Mattie Stitt. Martie is staying with Charlies sister up town this week.